You are here: Home / Documentation / FAQ / What share of particulate matter in Belgium originates from abroad? According to multiple studies and simulations, 70 to 80% of the measured concentrations is always present, even in absence of emissions in Belgium. 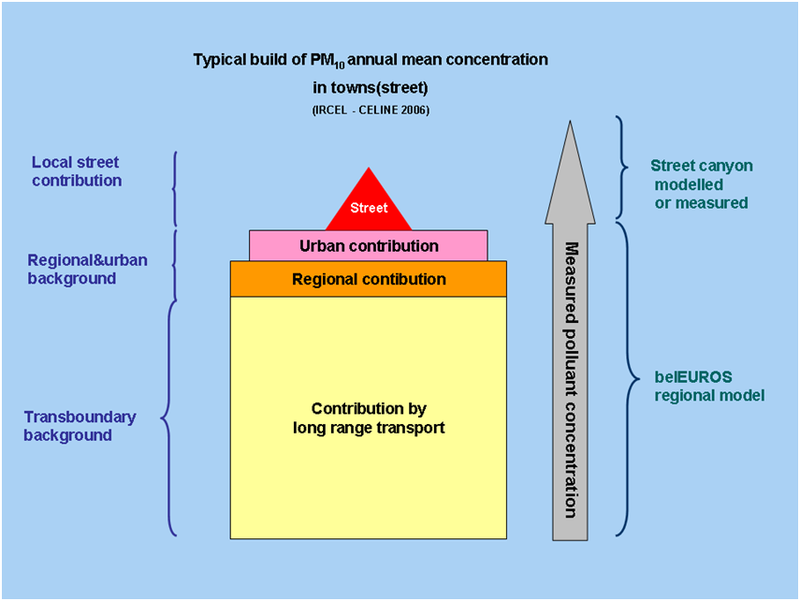 This proves that a large part of PM10 pollution can probably be alocated to long distance transportation. Besides this share (transboundary background) there are other regional and local contributions. In zones with high emissions of particulate matter (agglomerations, industrial zones,...) the impact of local emissions on measured concentrations is much more important. From another point of view, it is noticeable that emissions originating from abroad will have a large impact on the annual mean concentrations, whereas daily exceedances of the treshold will be mostly related to local emissions. Vice versa, it can also be stated that a lot of 'Belgian' particulate matter is being exported abroad; a statement that is supported by the figure below. This figure shows the decrease in PM2.5 concentrations throughout Flanders and the neigbouring countries, in case Flemish emissions would be completely absent.